We can choose our destiny or our path, but we can't choose both. Do you want to enjoy a life blessed by God; a life that's like a fruitful tree, a happy and healthy sheep or a satisfied guest? That is a choice of your destiny, and the path to that destiny is then decided for you: follow the LORD's ways revealed in His Word. Or, you can choose instead to follow the world's ways by listening to the counsel of the wicked, the sinful and the scornful. But, if you choose that path, then the destiny is decided for you: a life that's like chaff, for the wicked will perish. There are many Biblical examples and historical examples of those who exercise faith even when their circumstances are discouraging. When I consider how they persisted in their faith despite the circumstances presented to them, I'm encouraged to remain faithful and obey the LORD nonetheless. Pastor's Desk: What Can I Bring? …as we grow up in our relationship with God, our faith in His abilities should grow and our confidence in Him should become greater with each new experience of His power and as we encounter situations where He demonstrates His wisdom and timing. Every follower of Jesus Christ has been called to into the mission of the Master to make disciples of all nations. A Christian is someone chosen by God to draw near to Jesus Christ, believe in Him for salvation and eternal life, and then bear witness of Him to the rest of the world. It's really not complicated, but on a day when project deadlines loom, children are sick, or travel plans are cancelled, we quickly forget our calling and mission. Looking again at Jesus' instructions to the original Twelve in Matthew 10, we are reminded of several things about the Master's Mission. The essence of the disciples' mission is exactly the same as Jesus' mission was among them. As He had preached and done among them, they were to go to "the lost sheep of Israel" to preach and do the same. Then, after Jesus completed His earthly mission of atoning for sin through His death, His mission for the disciples became much broader, as He commanded them to "Go and make disciples of all nations..." (Matthew 28:19). We can learn several things from Jesus' instructions to the Twelve in Matthew 10 as we apply those instructions to the mission Christians have today. 1. The disciple of Jesus must depend on God's provision. The Twelve were instructed to travel very light and depend on the hospitality of those who would receive their message. 2. The disciple of Jesus is sent out like sheep among wolves. Some villages and homes would welcome them, but others would outright reject them. They could expect to be arrested, punished, betrayed, and persecuted, made to suffer and even put to death. 3. The disciple of Jesus need not be anxious nor afraid. Jesus gave them several assurances because He knew that the rejection they faced could lead to worry or fear. The Spirit would speak through them, He assured, so they need not be anxious about what to say when arrested. Their message would one day be vindicated, so they should boldly proclaim it from the rooftops. Their enemies could, at worst, kill the body and not the soul, and they were very precious to their Heavenly Father. Today, if you are a Christian, you have one fundamental mission to fulfill, the Master's mission of making disciples of all nations. Any current vocation or calling of yours should be a means for you to fulfill what the Master has called you to. And as you confess Christ before men, you will be welcomed by some and rejected by others. But anxiety and fear must never dissuade your allegiance to Jesus Christ. Your willingness to lose your life for His sake may even be tested. But, remember, if you lose any friends or family members over your allegiance to Christ, "you shall receive a hundredfold and inherit eternal life" (Matthew 19:29). No suffering for Christ's sake, however severe it may be, can ever compare to the suffering of eternal condemnation in the Lake of Fire. And, those who receive your message stand to gain hope, healing, and eternal life. The world is under condemnation for their sin and rebellion against God. People remain dead in their trespasses and sins and they will one day face the judgment and the second death. Since the problem of evil and sin lies within their hearts, the only solution for them is the life-changing power of God through faith in Jesus Christ. As foolish as it may seem to us, God chooses to send you and me to bear witness of Jesus Christ among them! "All authority in heaven and on earth has been given to me. Therefore go and make disciples of all nations, baptizing them in the name of the Father and of the Son and of the Holy Spirit, and teaching them to obey everything I have command you. And surely I am with you always, to the very end of the age." - Jesus Christ (Matthew 28:18-20). God doesn't always do what you'd expect - after all, He saves sinners like you and me by grace through faith. The Gospel of Matthew, among the best known books of the Bible, was written by a sinner saved by God's grace. Matthew was a tax collector, a man despised by his fellow Jews because people in his vocation were notorious for dishonest gain, extortion and abuse of authority. They, along with other "sinners," were the scum of their society. Yet, when Jesus saw Matthew, He said, "Follow me" and Matthew left everything behind and followed Him. His account of Jesus' ministry and miracles has since been a part of the most influential book in all of history. "Why does your teacher eat with tax collectors and 'sinners'?" After Matthew decided to follow Jesus, he hosted a banquet for Jesus in his home and many tax collectors and sinners came to eat with Jesus. The Pharisees were expecting a Messiah who, like them, would condemn tax collectors and sinners. But Jesus explained his reason for eating with them, "I have not come to call the righteous, but sinners." There will certainly be a time for judgment for the sinner, but God is patient, "not wishing for any to perish but for all to come to repentance" (2 Peter 2:9). Jesus ate with sinners because He wants to give us sinners an opportunity to repent of our sinful ways and respond to His call to an extraordinary life of following Him. "How is it that we and the Pharisees fast, but your disciples do not fast?" John the Baptizer's disciples were familiar with fasting, but Jesus and His disciples freely ate. While fasting would have been appropriate for a time of mourning over sin, demonstrating repentance and seeking the LORD's mercy, it was not appropriate for the time of Jesus' presence among His disciples. Expecting them to fast, He said, was like expecting wedding guests at a wedding to mourn instead of celebrate. Here again, Jesus did not conform to the expectations of His observers. He did not fast with His disciples because His presence is a time to celebrate. We should be so grateful that the LORD doesn't always do as we humans expect. He chose to use a crucified Christ as an atoning sacrifice to save the sinner. He calls the lowly, despised and weak among us to shame the strong. He displays His strength and wisdom through our weakness and foolishness. He deliberately makes it impossible for people to boast in themselves and take pride in their own accomplishments. He saves us by His grace through faith, "and this not from yourselves, it is the gift of God--not by works, so that no one can boast" (Ephesians 2:8-9). The next time you want God to meet your expectations, remember that it's a good thing He doesn't always do what we expect of Him. Rejoice that He chose sinners like Matthew and like you and me, and called us to an extraordinary life of following Jesus. Celebrate His grace that is greater than our sin. John Newton (author of "Amazing Grace" on the three wonders of heaven: "When I get to heaven I shall see three wonders there. The first wonder will be, to see many people there whom I did not expect to see. The second wonder will be, to miss many people whom I did expect to see; and the third and greatest wonder of all, will be to find myself there." Forgiveness heals us of the deepest injuries and wounds inflicted on us by our sins. "Take heart, son; your sins are forgiven." In Matthew 9:1-8, Jesus used an opportunity to heal a man of his paralysis, to heal him of a much deeper problem, his sin. The scribes who were present mistook His statement as blasphemy, an insult to God. And, it would have been, had Jesus not been the Son of God with power over sin and the authority to forgive. Jesus chose to demonstrate that power and authority, by first forgiving the man's sin and before making him walk again. Which is easier to say to a paralyzed man? To say, "your sins are forgiven," or to say "get up and walk"? It's easier to say "your sins are forgiven" because those present are unable to disprove such a statement. So, proving the easier by also doing the more difficult, Jesus then told the man to get up and walk, leaving the crowd "filled with awe" and praising God. But for Jesus to say, "your sins are forgiven," He would later also have to do something very difficult. He would bear the weight of the man's sin and ours. He would endure the agony and pain of being scourged, the shame and jeering of those who stood and mocked, the weight of an unbearable cross and the torment of hanging by his wrists and heels. He would literally have to offer His last breath to make that statement effective because "the wages of sin is death" (Romans 6:23). Jesus' sacrifice: His death for my life, His righteousness for my sin. We are all broken by sin to one degree or another. Wounded and scarred by our sins and the sins of our forebears. But, once we have received Jesus' healing touch and received His forgiveness, we can finally be made whole again. Healed, restored, renewed, forgiven. We all have a friend who also needs that healing touch in the deepest part of their soul. They need to hear that their sins are forgiven. Will you be bringing that friend to Jesus, too? Have you ever experienced the fear of death? Passengers aboard Air France flight 66 last Saturday must have been very fearful when the A380's engine blew up at 38,000 feet above sea level. Parts of the engine came apart in mid-air over the Atlantic requiring the pilots to declare "May Day" and make an emergency landing in Goose Bay, Canada. Thankfully, they made a safe landing and everyone got off the plane unharmed. But, what if you were faced with such a fearful situation? Or, maybe not the fear of death, but the fear that comes with uncertainty, trials, difficulties and challenges? Jesus wants to calm the storms of your life. Really? No, not really. When Jesus told His disciples to cross the Sea of Galilee, He took them through a life-threatening storm that suddenly raged against them and caused them to fear for their life. When He woke from His sleep, He first rebuked them before He rebuked the wind and the waves. He said to the disciples, "You of little faith, why are you so afraid?" before He commanded the winds and waves to calm down (Matthew 8:26, NIV). When the winds and waves died down immediately, you would expect the disciples to be very relieved and calm. Instead they were more afraid than before, asking themselves, "What kind of man is this? Even the winds and the waves obey him!" Some preachers will say that Jesus wants to calm the storms of your life. But, I don't think that's the point of this incident and the reason it has been recorded in the Gospels for us. I believe this happened to demonstrate who Jesus really is by His power over nature. It was part of how the disciples realized they were following the Son of God. When God takes us through a difficult and fearful experience, I believe He wants us to have faith in Him instead of fear. And, I believe that He will demonstrate to us something about His character and abilities that will grow our faith and confidence in Him. When they reached the other side, Jesus also demonstrated His power over demons who had possessed two men and held an entire village captive in fear. As the Son of God, Jesus also has power over the supernatural, spiritual forces of evil. His authority over them has also been delegated to His disciples and the demons are thus subject to us who speak in Jesus' name. As you follow Jesus, remember that when you are with Him, you walk with the One who has power over all nature and all supernatural forces of evil and darkness. We will always be a threat to the Prince of Darkness because we walk with the Light of the World, and he will do his part to cause us to live in the fear of uncertainty, trouble and death. But, "the One who is in you is greater than the one who is in the world" (1 John 4:4, NIV). Following Jesus means that we are always with the One with all power, authority and strength. Are you going through something difficult or challenging right now? Does it seem like an uncontrollable storm is raging around you and you are afraid of drowning? God may or may not calm that storm. Through it, He expects you to keep trusting Him and He will soon show you what He is capable of. Remember, there is no room for fear when our faith is in God. Too often, we sign up to do something without considering all that the commitment may require of us. In many cases, we trust the recruiter enough. In other cases, we figure that we can always back out of our commitment. What do we commit to when we respond to Jesus' call: "Follow Me"? In last Sunday's message, we saw how Jesus interacted with two individuals who wanted to follow Him. One was a teacher of the Law (i.e. a scribe), the other a "disciple." The scribe was ready to follow Jesus wherever He would go, but the disciple was asking permission to go and bury his father before he could follow Jesus. Jesus' response to the scribe made it clear that following Him required careful consideration of the price he would have to pay. Following a teacher meant learning from them and becoming like them and Jesus was more than an ordinary teacher. He was the "Son of Man," who would be rejected and suffer humiliation and pain on a cross. Following Him would not have the prestige or recognition the scribe was expecting. Elsewhere (see Luke 14:25-33), Jesus explained to those who desired to follow Him what it meant to be a "disciple" of His: (1) They must be willing to forsake precious family members and even their own life, (2) they must be willing to endure suffering, and (3) they must be willing to forsake all their earthly possessions. In other words, if you are going to follow Jesus wherever He would go, consider first that you must pay the highest price. The disciple who wanted to first go and bury his father revealed that he wasn't quite ready to follow Jesus at that moment. Maybe he was waiting until he would receive his inheritance, or maybe he had received word that there was an obligation waiting for him at home. Jesus' response to that disciple made it clear that following Him required immediate and complete obedience. Jesus is the Son of God who has the highest authority, so every other obligation, desire or intention needs to be surrendered to Him as our highest priority. Are you a disciple of Jesus Christ? Is there an instruction from Him that you have still been avoiding or neglecting? Are you being partially obedient or delaying your obedience in any given area that His Word addresses? Is there anything that keeps you too busy from spending time alone with Him? Following Jesus means that He is worth the highest price we must pay and He has become the highest priority in our life. As I consider my commitment to follow Jesus, I remember also, that whatever price I have paid or will have to pay to faithfully follow Jesus, I have been or will be rewarded with something far greater than I could have ever imagined! "The cancer treatments could have been very devastating for us, but did God still love us? Yes he did. Had his love for us changed? No it had not. "At times I went before the heavenly Father and saw behind my child the Cross of Jesus Christ and I said 'Father, don’t ever let me look at my circumstances and question your love. Your love for me was settled on the Cross. That has never changed and it never will.'" When we are in need of a healing miracle, many of us will turn to God. Some will come to Him and claim their healing, expecting to receive their miracle because they prayed for it and believed it would happen. But, if they do not receive their miraculous healing, either they will be disappointed in God and question His love, or they will reason it away as a lack of faith on their part. The leper who came to Jesus for healing did not doubt Jesus' ability to cleanse him, but was uncertain only about His willingness: "Lord, if you are willing, you can make me clean." The centurion who asked Jesus for his servant to be healed believed that Jesus had the authority to heal by a simple command. His servant was healed the moment Jesus declared it, though nothing is said about his servant's faith in Jesus. Peter's mother-in-law was so completely healed of her fever that she was able to immediately serve her guests. And, the many sick who came to Jesus for healing that evening needed to be set free from evil spirits. Through those miracles, we know that God as all authority over all sicknesses and disease and that His healing miracles do not depend on our faith. We so often misunderstand what is meant by "your faith has made you well." We certainly need faith in God, or we wouldn't bring our need to Him, and we certainly need to believe that He is capable of healing every disease. But, if He has the authority over everything that He has made, then He certainly also has the authority to deny us our request. God can have a variety of reasons to deny or accept our request for a healing miracle. Among the reasons to deny our request may be His desire to call us home to His presence in heaven. So before we claim our healing, let's remember to bring our needs to Him as requests, not demands. And, let's remember when we bring our requests, to say to God, "nevertheless, Thy will be done" and trust Him, both for His ability to heal and for His wisdom choose the right response. When Kim was diagnosed with breast cancer last year, we shared that news with just our family, our church family and a few close friends. We went to our good and loving Father in prayer and we followed the advice of our capable doctors. Thankfully, the lumpectomy and radiation treatments were successful and just recently, through follow-up scans and mammograms, Kim received the "all clear." We didn't receive a healing miracle but we are continually sustained supernaturally and we feel God's intimate presence. Like Henry Blackaby (quoted above), we never questioned God's power or His love for us throughout our experience, because we know that He sometimes allows His loved and chosen ones to suffer. After all, He let His Beloved Chosen Son suffer the Cross to give us eternal life and draw us into His presence. If you think you can twist God's arm, by claiming your healing miracle in faith, then you can't also be expecting to see His mighty hand and outstretched arm. 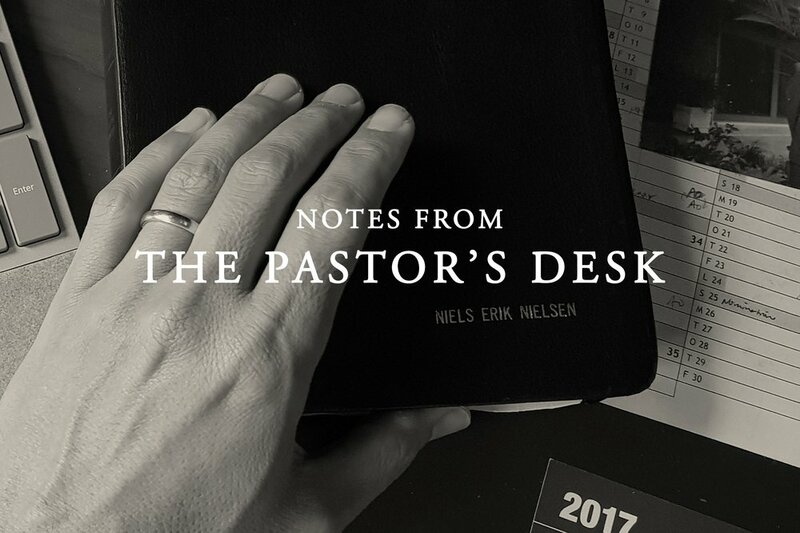 Introducing The All New 'Pastor's Desk' Online! Wow, what a weekend! FIBC Day last Saturday was well attended despite the threat of rain and the potluck table under the tent was chock full of delicious dishes and desserts. It quickly became a well-known fact that it was also my birthday. But what we really were celebrating was our FIBC family of many nations, a body of Christ with many members. But we should be asking, “where do I belong in this body?” Because I need others to become the person God made me to be and because I care about others, I should belong to a local church like FIBC and be an actively functioning member. *Today's Spiritual Challenge: Do you know how you have been gifted? Are you helping a local church like FIBC achieve its mission and fulfill its purpose? Are you currently serving on a ministry team? Find out where you belong. Today. Special thanks to Styfens for this lovely FIBC DAY video, feel free to share on Facebook!